A gilded bronze handle (with traces of red pigment) in the shape of a dragon's head, made during the Eastern Han; depending on circumstance, the dragon could be a symbol of either good or bad omen for the Han emperors. In ancient China, the rulers of the Shang (c. 1600 – c. 1050 BC) and Zhou (c. 1050 – 256 BC) dynasties were referred to as kings (王 wang). 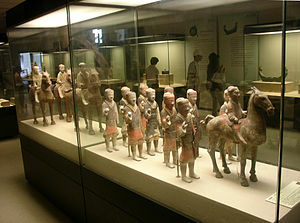 By the time of the Zhou dynasty, they were also referred to as Sons of Heaven (天子 Tianzi). By 221 BC, the King of Qin, Ying Zheng, conquered and united all the Warring States of ancient China. To elevate himself above the Shang and Zhou kings of old, he accepted the new title of emperor (皇帝 huangdi) and is known to posterity as the First Emperor of Qin (Qin Shi Huang). The new title of emperor was created by combining the titles for the Three Sovereigns (Sanhuang) and Five Emperors (Wudi) from Chinese mythology. This title was used by each successive ruler of China until the fall of the Qing dynasty in 1911. From the Shang to Sui (581–618 AD) dynasties, Chinese rulers (both kings and emperors) were referred to by their posthumous names in records and historical texts. Temple names, first used during the reign of Emperor Jing of Han (r. 157–141 BC), were used exclusively in later records and historical texts when referring to emperors who reigned during the Tang (618–907 AD), Song (960–1279 AD), and Yuan (1271–1368 AD) dynasties. During the Ming (1368–1644 AD) and Qing (1644–1911 AD) dynasties, a single era name was used for each emperor's reign and became the preferred way to refer to Ming and Qing emperors in historical texts. Use of the era name was formally adopted during the reign of Emperor Wu of Han (r. 141–87 BC), yet its origins can be traced back further. The oldest method of recording years—which had existed since the Shang—set the first year of a ruler's reign as year one. When an emperor died, the first year of a new reign period would begin. This system was changed by the 4th century BC when the first year of a new reign period did not begin until the first day of the lunar New Year following a ruler's death. When Duke Huiwen of Qin assumed the title of king in 324 BC, he changed the year count of his reign back to the first year. For his newly adopted calendar established in 163 BC, Emperor Wen of Han (r. 180–157 BC) also set the year count of his reign back to the beginning. Since six was considered a lucky number, Han Emperors Jing and Wu changed the year count of their reigns back to the beginning every six years. Since every six-year period was successively marked as yuannian (元年), eryuan (二元), sanyuan (三元), and so forth, this system was considered too cumbersome by the time it reached the fifth cycle wuyuan sannian (五元三年) in 114 BC. In that year a government official suggested that the Han court retrospectively rename every "beginning" with new characters, a reform Emperor Wu accepted in 110 BC. Since Emperor Wu had just performed the religious feng (封) sacrifice at Mount Taishan, he named the new era yuanfeng (元封). This event is regarded as the formal establishment of era names in Chinese history. Emperor Wu changed the era name once more when he established the 'Great Beginning' (太初 Taichu) calendar in 104 BC. From this point until the end of Western Han, the court established a new era name every four years of an emperor's reign. By Eastern Han there was no set interval for establishing new era names, which were often introduced for political reasons and celebrating auspicious events. At times, especially when an infant emperor was placed on the throne, a regent, often the empress dowager or one of her male relatives, would assume the duties of the emperor until he reached his majority. Sometimes the empress dowager's faction—the consort clan—was overthrown in a coup d'état. For example, Empress Lü Zhi (d. 180 BC) was the de facto ruler of the court during the reigns of the child emperors Qianshao (r. 188–184 BC) and Houshao (r. 184–180 BC). Her faction was overthrown during the Lü Clan Disturbance of 180 BC and Liu Heng was named emperor (posthumously known as Emperor Wen). 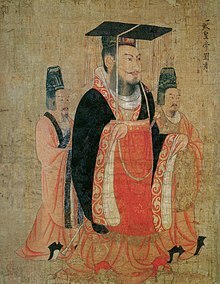 Before Emperor Wu died in 87 BC, he had invested Huo Guang (d. 68 BC), Jin Midi (d. 86 BC), and Shangguan Jie (上官桀)(d. 80 BC) with the power to govern as regents over his successor Emperor Zhao of Han (r. 87–74 BC). Huo Guang and Shangguan Jie were both grandfathers to Empress Shangguan (d. 37 BC), wife of Emperor Zhao, while the ethnically-Xiongnu Jin Midi was a former slave who had worked in an imperial stable. After Jin died and Shangguan was executed for treason, Huo Guang was the sole ruling regent. Following his death, the Huo-family faction was overthrown by Emperor Xuan of Han (r. 74–49 BC), in revenge for Huo Guang poisoning his wife Empress Xu Pingjun (d. 71 BC) so that he could marry Huo's daughter Empress Huo Chengjun (d. 54 BC). Since regents and empress dowagers were not officially counted as emperors of the Han dynasty, they are excluded from the list of emperors below. Below is a complete list of emperors of the Han dynasty, including their personal, posthumous, and era names. Excluded from the list are de facto rulers such as regents and empress dowagers. 1 — Ruzi was prince, rather than emperor of Han. Officially, the throne of emperor of Han was vacant during 6AD to 9AD. ^ The years of the Chinese lunisolar calendar do not correspond exactly with the years given in the column for era names. Some years given in the table also belong to two reign periods because some era names were adopted before the beginning of the following year. ^ Hymes 2000, p. 36. ^ Latin spelling, Chinese characters, and date range come from Paludan (1998), 28 and Loewe (2000), 253–258. ^ Latin spelling, Chinese characters, and date range come from Paludan (1998), 28, 31. ^ a b c Latin spelling, Chinese characters, and date range come from Twitchett and Loewe (1986), xxxix. ^ a b Latin spelling, Chinese characters, and date range come from Paludan (1998), 28, 33. ^ Latin spelling, Chinese characters, and date range come from Paludan (1998), 28, 36 and Loewe (2000), 273–280. ^ a b Latin spelling, Chinese characters, and date range come from Paludan (1998), 40. ^ a b c d e Latin spelling, Chinese characters, and date range from Paludan (1998), 40, 42. ^ Bo Yang (1977), 495. While traditional sources do not give a exact date when the Yuanshi era was announced, it was implied that the first year of Yuanshi did not start until the first month of the lunar calendar — ergo, in 1 AD. See, e.g., Ban Gu, Book of Han, vol. 12. ^ Latin spelling, Chinese characters, and date range from Paludan (1998), 42–43. ^ Latin spelling, Chinese characters, and date range from de Crespigny (2007), 558–560. ^ Latin spelling, Chinese characters, and date range from Paludan (1998), 44 and de Crespigny (2007), 557–566. ^ Latin spelling, Chinese characters, and date range from Paludan (1998), 44, 49 and de Crespigny (2007), 604–609. ^ Latin spelling, Chinese characters, and date range from Paludan (1998), 44, 49 and de Crespigny (2007), 495–500. ^ Latin spelling, Chinese characters, and date range from Paludan (1998), 50 and de Crespigny (2007), 588–592. ^ Latin spelling, Chinese characters, and date range from Paludan (1998), 50 and de Crespigny (2007), 531. ^ Latin spelling, Chinese characters, and date range from Paludan (1998), 50 and de Crespigny (2007), 580–583. ^ a b Latin spelling, Chinese characters, and date range from Twitchett and Loewe (1986), xl. ^ Latin spelling, Chinese characters, and date range from Paludan (1998), 50–51 and de Crespigny (2007), 473–478. ^ a b Latin spelling, Chinese characters, and date range from Paludan (1998), 50–51. ^ Latin spelling, Chinese characters, and date range from Paludan (1998), 50, 52 and de Crespigny (2007), 511–517. ^ Latin spelling, Chinese characters, and date range from Paludan (1998), 50, 55.